The ruling NRM party chairperson Yoweri Museveni, ordered for the sacking of more than 200 employees at the party sectretariat. 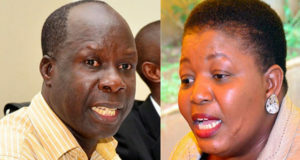 Dr. Tanga Odoi, the party electoral chairman revealed this to PML Daily, explaining that the decision to call for the sacking was made after employees complained to their chairman about ghost workers in the payment system. “Not all people who are taking a salary at Plot 10 are genuine. We complained to the Head of State. We went into salary arrears because we don’t know who was getting paid at Plot 10. Out of our complaint, the President said we lay off the workers to know who is genuine,” Odoi revealed. He added that before involving the President, the party executive agreed that non-staff should not be paid. “We even wrote a letter to the secretary general to give us the list of those workers and she refused. There is a dark spot in this exercise. We have not had a salary for 10 months,” Dr Odoi revealed. Odoi’s explanation differs from that of Justine Kasule Lumumba, the party secretary general, who told journalists yesterday at the party headquarters that the exercise was a restructuring move being carried out across the country as a result of a financial crisis and that the party needs to hire professional workers. “When we took over responsibly as the secretariat [in 2015], you could find a graduate as an office assistant. Then you find a certificate holder in IT. We want to realign people based on their qualifications, because it is disheartening to be a degree holder earning less than a certificate holder,” she said. On how many staff members are to lose their jobs, the secretary general said about 200 staff will lose their jobs in two months. These, she said, will each be paid salary arrears for the past seven months and will be laid off two months from now. However, Lumumba said the staff members who lost jobs can reapply and be reemployed because of their experience from working with the party. In the new structure, she said the Secretariat will be more involved in supervising the implementation of the NRM manifesto by government. The sacking of more than 200 employees is worrying the party chairpersons in Kampala city. Salim Uhuru, the party chairman Kampala Central said the directive by the President will have a negative political bearing in the city. “Those sacked are going to join FDC. Already, we are not doing well in Kampala. I thought our senior party leaders sat down to discuss and find solutions to why the party is losing popularity especially in urban areas,” Uhuru explained. Uhuru also castigated the party administration for failing to pay monthly rent for offices and instead of injecting money in those who are opposing them. “We use our money to pay the monthly rents. The secretariat doesn’t give us any coin. I have raised this issue but it has fallen on deaf ears,” he added.